This past weekend I played in a local hat tournament called Juanito's Open, put together by the Quijotes' very own Juanito. We played in La Almudena, where we normally scrimmage on Saturday afternoons. The weather was perfect and the atmosphere was relaxed. There were three teams of players at this year's Juanito's Open: red, white, and black. I was on the white team, and we named ourselves Horchata. I think each team played four games that day. We were sure to play the normal "post-game games" after each frisbee game, since we weren't crunched for time. Before the final two games that day, four of us walked to a nearby bar inside one of the dorms and bought 20 burgers to bring back to the fields. That afternoon, Hermann and Justin set up their jumping invention thingy called "The Contraption," an adjustable pole to see how high people can jump and successfully grab a disc. According to Herm, it's based off of The Skylight, and not only does it help teach people how to jump, but it gives people a grasp of how high you are able to catch the disc as well. After the last two games, my team Horchata had won the tournament! Notice how white my jersey is in the picture below. Little did I know, that wouldn't last long. We took team pictures, and then some of us even did our usual post-practice stretch circle. And then the excitement happened. Some of us had left the sidelines and started playing for fun out on the field. Then we decided to do a lefty point. The disc is coming near me so I run for it, reach up with the left arm, and WHAM. Next thing I know I'm on the ground. I had run into another player who was going after the disk as well. I thought I was okay, just a bit shocked. Then I glanced down at the ground and saw my glasses in pieces. People walked with me to the sidelines, and suddenly there were a million hands washing dirt and blood off of my face. "That is a huge bump over her eye. Put something cold on that." "Is that glass in her face? Should I pull it out?" "Ok, this might hurt. *pull* Oh god." "I'm gonna try to wash that out. Does this hurt?" Here's the picture of me when my amazing friends were done with their impromptu wound-cleaning. 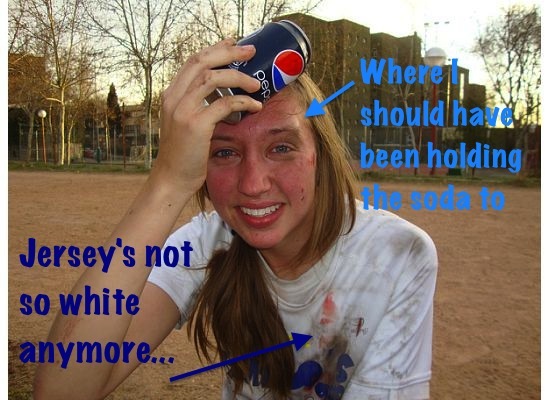 I didn't know where the bump was on my head, so I was holding the pepsi in the completely wrong place. I went with Hannah to the nearby bar; I wanted to check myself out in a mirror. The people at the bar gave me a bag of ice to put over my eye, and we walked back to get our stuff from the field. Some people had left by that point anyway, and the rest were packing up to go home and shower before that night's tournament dinner. So we helped pick up garbage and water bottles, then headed to the metro. When I got home I stopped at the farmacia just outside of my apartment to see if they had some sort of rubbing alcohol I could put on my cuts (those fields are not clean at all). The pharmacist sent me off with some cristalmina, and warned me to avoid the sun until my face healed. I showered, sprayed cristalmina all over my face and left ear, threw on some clothes, then headed back out for the dinner. Thirteen of us had opted for the tournament's dinner, and thirteen full pizzas were served. You do the math. I ate at least eight pieces throughout the dinner, which I'm pretty sure was a whole pizza. Yum. We went to a nearby bar afterwards, but I was so exhausted I only stayed for a little bit before heading home to bed. After all, we had to be up again in the morning for day two of the tournament: Ultimate - Street Edition. The plan for Sunday was to play ultimate near some monuments and famous plazas downtown (if we didn't get kicked out).